The loss of a child for a parent has to bring great sadness a sadness and grief like no other. If you were to ask any parent how long after the death of a child they were able to even think of smiling, let alone smile again, not laugh, but smile, or at how long it took them to be able to smile again when their child was perhaps missing I'll wager that unlike Gerry McCann, they would not have been laughing their head off 6 days after their child was lost to them. 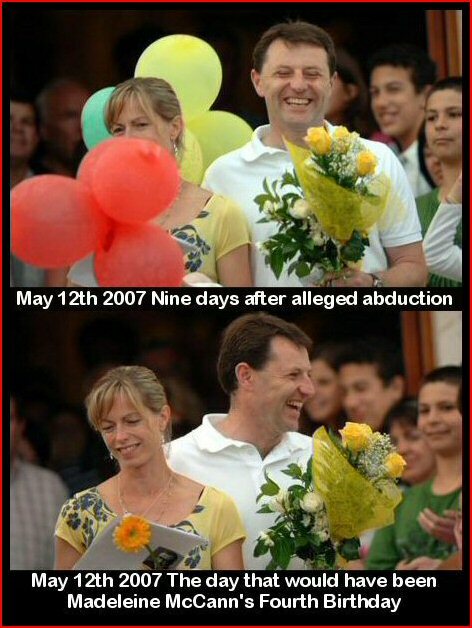 Gerry McCann 6 days after Madeleine vanished appears to be a very happy chappy! And (below) days later on what would have been Madeleine's 4th birthday McCann could not smile wider if he tried. "I don't really want to talk anything about trolls, we're here to talk about child rescue"
But that's McCann for you. He can stand there and preach about making the world a better place as long as no one asks him to be a better person and conduct himself in an appropriate manner and acknowledge the sad death of Brenda Leyland. Nothing could be more important than a child's life he stated, yet he, his wife Kate McCann and their holiday buddies REFUSED to fully co-operate with police. Refused to answer police questions (their right under the law there is no dismissing that fact - but hell what parent refuses to help their missing child) and REFUSED to take part in a reconstruction of the events of the night the child was reported as missing when requested to do so by police. It is the strangest of things. When Madeleine vanished, in interviews we always heard of how she was such a special child to them, they emphasised how difficult it was for Kate McCann to become pregnant re-enforcing for the listener just how special Madeleine was, to emphasize how they would never harm her - how she was a much longed for child. But it is EXACTY that which I do not understand. Why would you leave this longed for child alone night after night in a dark scary holiday apartment to look after two two year olds the child scared witless she and her siblings when they woke in the dark as their parents have told the world, crying, alone, afraid. And the biggie -WHY would you not fully co-operate with police? WHY would you defend your buddies who ALL REFUSED to assist police with their investigations by taking part in a reconciliation of events? If Madeleine was so much more special to them as they repeatedly have said why in hell did they not do ALL in their power to help the kid be found? Unfathomable - Or is it!